Pirate-themed and navy-themed slots are some of the most popular with slots players across the world so this offering from world famous developer Microgaming is certain to be a hit surely? Other slots out there including the spooky Ghost Pirates slot from NetEnt and the recently released Battleship slot from IGT have left a positive mark on players but at first glance this slot does just feel like any other run-of-the-mill Microgaming slot title. This is a 5 reel, 25 pay-line slot that appears to be set in the days of Christopher Columbus (the explorer, not the director!). The reels are set against what appears to be some sort of nautical map with old-fashioned sailing ships at the top. The symbols on the reels consist of a sailor, a few barrels of gun powder, a ships wheel and other such nautical images. The Wild symbol is represented by the cannon. This symbol can substitute for all other symbols except for the Scatters to complete winning combinations and help you to trigger pay outs throughout the game. There is the potential to win 2,000 coins if you manage to hit five Wilds across the reels. The sailor represents the Scatter icon and this is the symbol you will need to trigger the free spins bonus round. 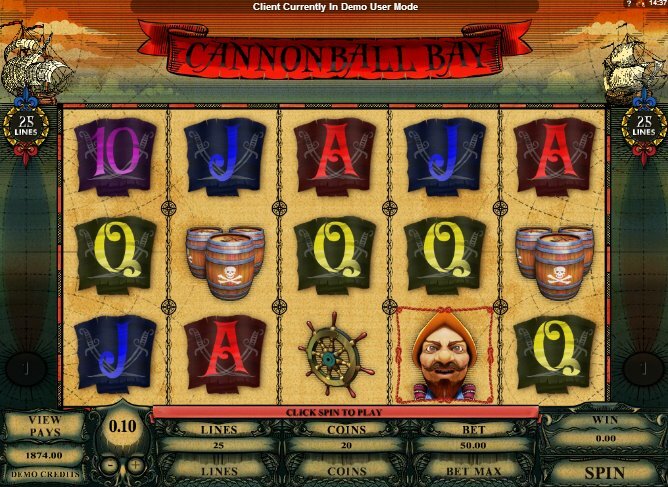 If you hit three of the sailors across the reels then you will be rewarded with 5 free spins. 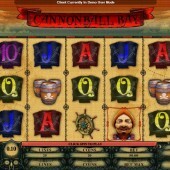 On each free spin, the cannon will appear and will bombard the reels with shots. Every symbol the cannon hits will turn Wild for that spin giving you the chance to hit some winning combinations. That is it for Cannonball Bay. After digging a little deeper it does appear that this is just another Microgaming slot with free spins, Scatters and Wilds. I’m sure the creative team at Microgaming busted a brain cell coming up with this slot. Nonetheless, for what it is, it is harmless fun. There could be more free spins on offer and the pay outs are not life-changing but if you want a few quick spins for a few minutes then why not give this slot a try? If you’re not expecting much, you won’t be disappointed.